Vivo, the Chinese smartphone maker that recently announced the world's first handset to feature an in-display fingerprint scanner, might also unveil the world's first phone to offer 10 GB of RAM. Or at least that's what a new rumor - picked up by plenty of relevant websites - is claiming. But we're here to cast serious doubt on this. The new rumor has it that Vivo's next generation flagship phone, apparently called Xplay7, will be a powerhouse packing Qualcomm's brand new Snapdragon 845 processor, a 4K screen covering 92.9% of the device's front, up to 512 GB of storage space, and - as already mentioned - 10 GB of RAM. 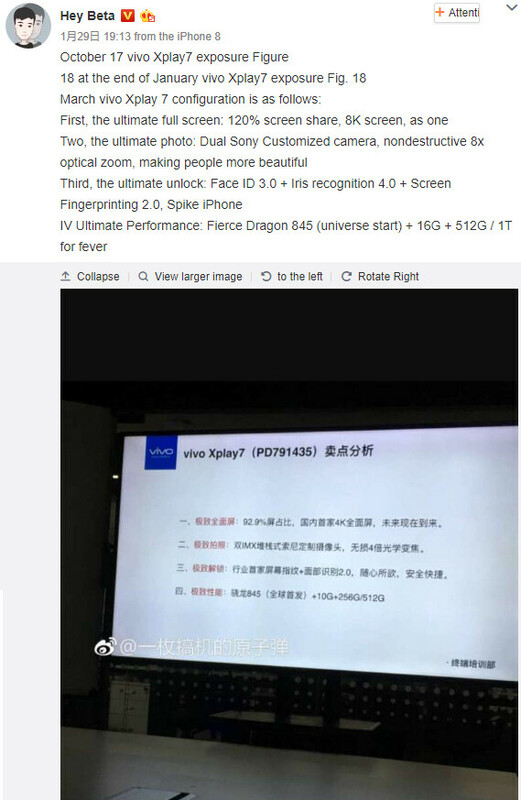 The exact origin of the rumor can't be traced, but these details seem to come from Weibo (one of China's largest social media platforms), where a slide listing the alleged specs of the Vivo Xplay7 can be found - see left. However, a wiser Weibo user has pointed to the existence of similar slides (from October 2017) which painted a different picture. According to the older slides, the Xplay7 should feature 8 GB of RAM, and up to 256 GB of storage space - thus being more or less normal, since we already have phones with 8 GB of RAM, as well as with 256 GB of internal memory. But the same older slides claimed that the handset's screen would cover 100% of its front - which is, well, hard to believe. All in all, it appears that these slides are simply fabricated for fun, and shouldn't be taken seriously. The wise Weibo user mentioned above says the next leaked slides could very well tout an 8K screen covering 120% of the phone's front (take that, logic and physics! ), 16 GB of RAM, and up to 1TB of storage space, simply because it's not hard to create fake images like these. Over the years, we've seen many Weibo-based rumors that never materialized, and it's very likely that this one won't materialize, either. We're not saying that smartphones with more than 8 GB of RAM won't be available at some point. It's just that the rumored Vivo Xplay7 might not be one of them. P.S. 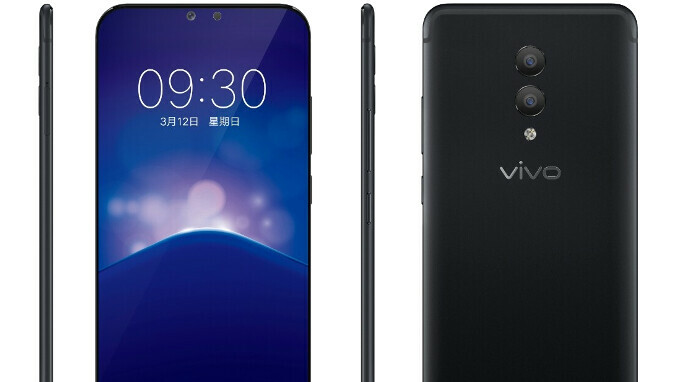 : The Vivo Xplay7 renders seen above have been around since October 2017, but they're probably fake, too. That stupid weibo user (no wonder he use that phone), those specs in slide isn't really impossible, VIVO could possibly make it since they like to rush thing to be "first".. If Galaxy S9 was powered with these specs then it would’ve been a dream smartphone. Hopefully Note 9 could bring a 512GB version to every market with a screen to body ratio of 90+ and 8GB Ram and 4K 120hz Amoled display! OLED can do 120Hz, with 60 blank frames and 60 actual frames. Wouldn't that just make it 60Hz actually then? What's the point of the blank frames? "What's the point of the blank frames?" That's like saying what's the point of virtual cores in PC. “Mobile Oled cant reach 120Hz. Current tech does not make it possible.” See this, vincelongman? This is what I too said before and you said I was spreading mis-info. Told you I wasn’t making this all up. And the price? Since the note 8 emperor edition is priced at $1,500. Having that kind of specs. Would be above the $2,000 margin. WHO WOULD BUY THAT? WHO WOULD BUY THAT? Celebrities would or anyone who's got cash to burn!